We are sad to announce the death of A.P. Films co-founder Arthur Provis. Arthur was born in 1925 in Reading, Berkshire and during the early years of his career he enlisted in the navy as a photographer, primarily operating rostrum cameras. Arthur first met Gerry Anderson during the production of You’ve Never Seen This with Arthur as cameraman and Gerry as director. Soon after, Pentagon Films was formed. After the successful completion of a several commercials, including one featuring a puppet version of popular children’s character Noddy (voiced by Denise Bryer, Terrahawks‘ Zelda), Pentagon Films was approached by television producer Roberta Leigh and given the task of producing a children’s television series entitled The Adventures of Twizzle for Associated-Rediffusion. Arthur and Gerry set up A.P. Films together in order to produce the series. The success of the Adventures of Twizzle lead to subsequent puppet series Torchy the Battery Boy and Four Feather Falls. Arthur left A.P. Films in 1959 under amicable circumstances following disagreements over the company’s strategy for the future. After Arthur left A.P. 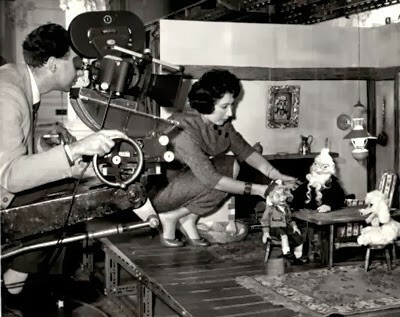 Films, he continued his association with Roberta Leigh, producing several other puppet series including Adventures of Sara and Hoppity and Space Patrol. Meanwhile, Gerry and A.P. Films also continued producing Supermarionation puppet series spanning Supercar, Fireball XL5, Stingray and Thunderbirds. After the production of Thunderbirds, A.P. films would become Century 21. Arthur worked with puppets once again for the pilot episode of the planned television series Paul Starr (which featured Ed Bishop, UFO‘s Ed Straker), but the concept was never turned into a full series. Likewise The Solarnauts, a live action science fiction pilot episode for which Arthur contributed model work, never became a series. After these pilot episodes had been completed, Arthur returned to producing television commercials. In his later years, Arthur was interviewed about his involvement with A.P. Films for the 2014 documentary Filmed in Supermarionation, directed by Stephen La Rivière. Next article The World Of The Future!